Preheat oven to 350F. Line large baking sheet with parchment paper or silicone baking mat. Set aside. In a large bowl, mix together the cake mix and baking powder. Set aside. In a smaller bowl, whisk together the eggs, oil, and vanilla by hand. Add the egg mixture to the cake mixture and stir to form a dough- stir vigorously until all of the pockets of dry cake mix are gone. 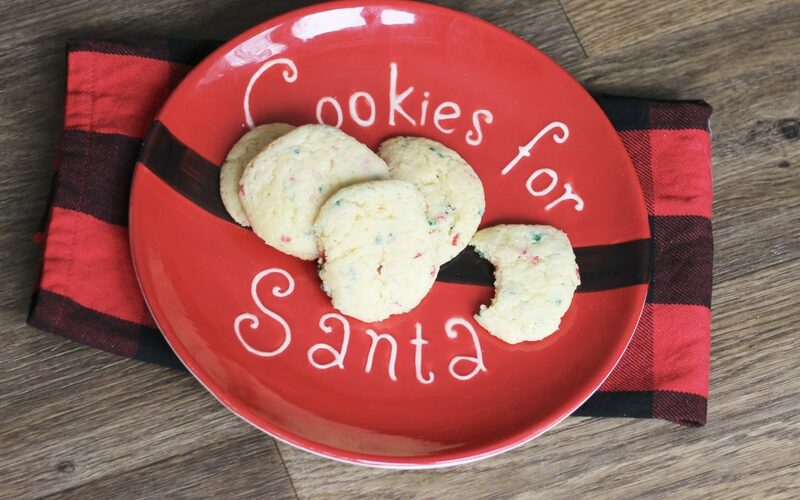 Gently mix in the sprinkles – you do not want to dye the cookie dough by overstirring the sprinkles. Drop rounded 1-inch balls of dough onto prepared baking sheet. Bake for 9 minutes – do not let the cookies get brown. Allow to cool on baking sheet for 3 minutes; they will be very soft at first. As they cool, the tops will settle down so you will not have to press the cookies down yourself. Transfer to a wire rack to cool completely. Store in an airtight container, for up to one week. Cookies freeze well, up to 2-3 months.